Using NASA's Hubble Space Telescope, astronomers have captured for the first time snapshots of fledgling white dwarf stars beginning their slow-paced, 40-million-year migration from the crowded center of an ancient star cluster to the less populated suburbs. White dwarfs are the burned-out relics of stars that rapidly lose mass, cool down, and shut off their nuclear furnaces. As these glowing carcasses age and shed weight, their orbits begin to expand outward from the star cluster's packed downtown. This migration is caused by a gravitational tussle among stars inside the cluster. Globular star clusters sort out stars according to their mass, governed by a gravitational billiard-ball game where lower mass stars rob momentum from more massive stars. The result is that heavier stars slow down and sink to the cluster’s core, while lighter stars pick up speed and move across the cluster to the edge. This process is known as "mass segregation." Until these Hubble observations, astronomers had never definitively seen the dynamical conveyor belt in action. 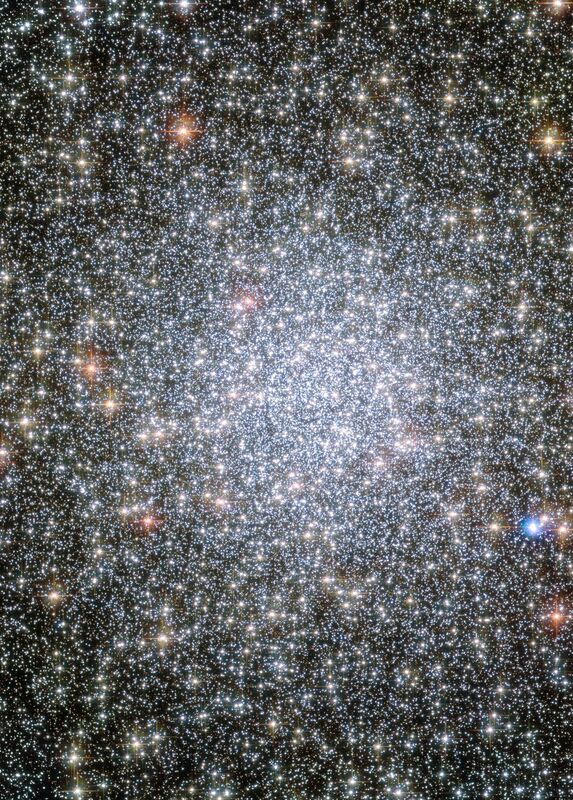 Astronomers used Hubble to watch the white-dwarf exodus in the globular star cluster 47 Tucanae, a dense swarm of hundreds of thousands of stars in our Milky Way galaxy. The cluster resides 16,700 light-years away in the southern constellation Tucana. "We've seen the final picture before: white dwarfs that have already sorted themselves out and are orbiting in a location outside the core that is appropriate for their mass," explained Jeremy Heyl of the University of British Columbia (UBC), Vancouver, Canada, first author on the science paper. The team's results appeared in the May 1 issue of The Astrophysical Journal. "But in this study, which comprises about a quarter of all the young white dwarfs in the cluster, we're actually catching the stars in the process of moving outward and segregating themselves according to mass," Heyl said. "The entire process doesn't take very long, only a few hundreds of millions of years, out of the 10-billion-year age of the cluster, for the white dwarfs to reach their new home in the outer suburbs." "This result hasn't been seen before, and it challenges some ideas about some of the details of how and when a star loses its mass near the end of its life," added team member Harvey Richer of UBC. Using the ultraviolet-light capabilities of Hubble's sharp-eyed Wide Field Camera 3, the astronomers examined 3,000 white dwarfs, tracing two populations with diverse ages and orbits. One grouping was 6 million years old and had just begun their journey. Another was around 100 million years old and had already arrived at its new homestead far away from the center, roughly 1.5 light-years, or nearly 9 trillion miles, away. Only Hubble can detect these stars because ultraviolet light is blocked by Earth's atmosphere and therefore doesn't reach ground-based telescopes. The astronomers estimated the white dwarfs' ages by analyzing their colors, which gives them the stars' temperatures. The hottest dwarfs shine fiercely in ultraviolet light. The dwarfs were tossed out of the rough-and-tumble cluster center due to gravitational interactions with heftier stars orbiting the region. Stars in globular clusters sort themselves out by weight, with the heavier stars sinking to the middle. Before flaming out as white dwarfs, the migrating stars were among the most massive in the cluster, weighing roughly as much as our Sun. The more massive stars burned out long ago. The migrating white dwarfs, however, are not in a hurry to leave. Their orbits expand outward at about 30 miles an hour, roughly the average speed of a car traveling in the city. The dead stars will continue this pace for about 40 million years, until they reach a location that is more appropriate for their mass. Although the astronomers were not surprised to see the migration, they were puzzled to find that the youngest white dwarfs were just embarking on their journey. This discovery may be evidence that the stars shed much of their mass at a later stage in their lives than once thought. 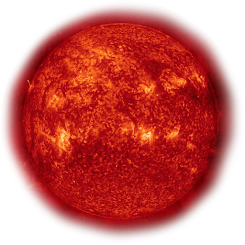 About 100 million years before stars evolve into white dwarfs, they swell up and become red giant stars. Many astronomers thought that stars lose most of their mass during this phase by blowing it off into space. But the Hubble observations reveal that the stars actually dump 40 percent to 50 percent of their bulk just 10 million years before completely burning out as white dwarfs. "This late start is evidence that these white dwarfs are losing a large amount of mass just before they become white dwarfs and not during the earlier red giant phase, as most astronomers had thought," said Richer. "That's why we are seeing stars still in the process of moving slowly away from the center of the cluster. It's only after they lose their mass that they get gravitationally pushed out of the core. If the stars had shed most of their weight earlier in their lives, we wouldn't see such a dramatic effect between the youngest white dwarfs and the older ones that are 100 million years old." Although the white dwarfs have exhausted the hydrogen fuel that makes them shine as stars, these stellar relics are among the brightest stars in this primordial cluster because their brilliant hot cores have been exposed, which are luminous largely in ultraviolet light. "When a white dwarf forms, they've got all this stored-up heat in their cores, and the reason we can see a white dwarf is because over time they radiate their stored thermal energy slowly into space," Richer explained. "They're getting cooler and less luminous as time goes on because they have no nuclear sources of energy." After making it through the gauntlet of gravitational interactions within the crowded 1.5-light-year-wide core, the traveling white dwarfs encounter few interactions as they migrate outward, because the density of stars decreases. "A lot of action happens when they're 30 million to 40 million years old, and continues up to around 100 million years, and then as they get older the white dwarfs still evolve but less dramatically," Heyl said. The 47 Tucanae cluster is an ideal place to study the mass segregation of white dwarfs because it is nearby and has a significant number of centrally concentrated stars that can be resolved by Hubble's crisp vision.